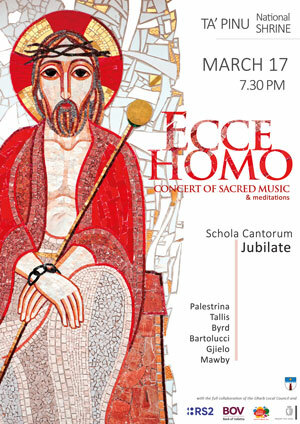 Ecce Homo will be held at Ta' Pinu National Shrine on Saturday 17th March by the prominent Schola Cantorum Jubilate, under the direction of Marouska Attard. As the title and liturgical season implies, the concert will consist of Lenten motets. For many music enthusiasts, these Lenten pieces are considered as masterpieces due to their own particular beauty. The programme will focus mainly on polyphonic pieces by Palestrina, Tallis, Byrd, Bach, Bartolucci, Mawby and Gjielo. Attendees will listen to organ pieces by Lo Muscio on the Johannes Monarch Church Organ, interpreted by organist Joseph Camilleri. The soirée will include also some reflections on humanity. These reflections are written by the choristers themselves. Schola Cantorum Jubilate will make use of different areas within the Shrine in order to explore different acoustics. Special light effects will help the audience admire the artistry of the exceptional unique architecture that the church boasts of. At Ta’ Pinu, there are not any processions or pageants that one finds in other Basilicas or parishes. This particular venue was always considered as a hub for spirituality and interior peace. In fact for this reason, this particular concert is being held at Ta’ Pinu. Undoubtedly, it is going to be an effective experience that will blend the concepts of meditation and artistry. The concert starts at 7.30pm. Entrance is free and everyone is invited. There will be a collection to raise funds for the church conservation. The SCJ Children’s choir was established in 2017 after consultation with the members of the Schola Cantorum Jubilate. It aims at giving children an understanding of choral music as well as an appreciation to some great choral works. This, being done while taking into consideration the children’s ages varying from 8, all the way to 12. Something new and exciting has been in production lately as the choir embarked on a recording session which will expand the choir’s singing to more people. 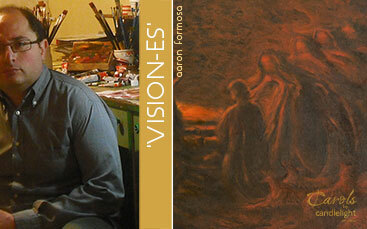 The foyer of St. Augustine’s Priory, during, ‘Carols by Candlelight’, will host an exhibition VISION-ES by Aaron Formosa.